Cody’s Gift Card Store – The Perfect Gift For Every Occasion! be happy to customize your order for you! 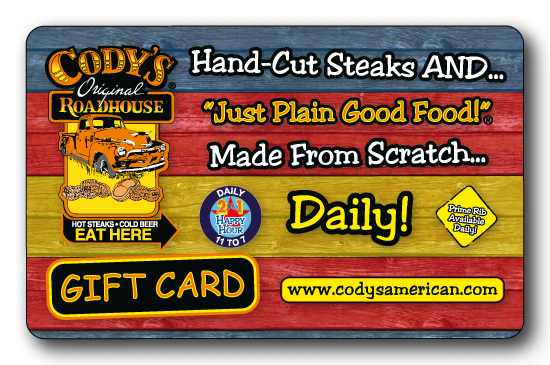 Cody’s Gift Cards may be ordered on-line or purchased at any of our locations. Purchases are available only for addresses within the continental United States. All Cody’s Gift Card orders will be shipped within 3 to 5 business days after purchase. United States Postal Service is closed for business. All Cody’s Gift Card Sales are final. Click Below To Check The Balance Of Your Cody’s Gift Card! Copyright Cody's American Restaurants, LLC © 2013. All Rights Reserved.